Where their design parameters and my preferences align have a lot to do with that action type. Their consideration of the variables of design are absolutely dead-on. The question arises as to execution in factory production. Our Publisher spent time with pre-production samples of the new gun before it was announced. After the announcement, he told me that Taurus really had something with the design of the TX22. If the preproduction units were anything like production guns, he predicted the gun would be successful. My sample arrived just before a recent road trip during one of the wettest, coldest fall-winter seasons in recent memory. 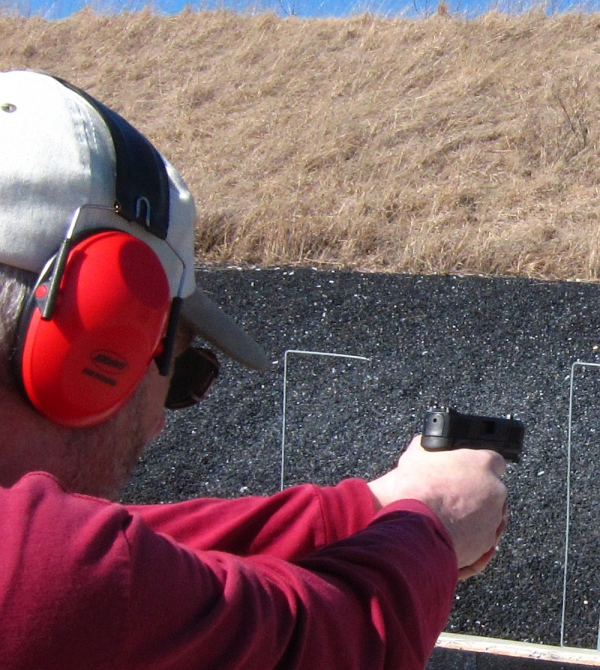 Getting to a range wouldn’t be a problem, but getting back out could be dicey. Upon my return, it was time for one of our annual ‘retirees’ events, the range outing to be in compliance with the Law Enforcement Officers Safety Act. I took the TX22, some Remington Golden Bullet ammo and a Safariland Custom Fit Model 568 paddle holster. It’s easy for me to shoot a gun, write it up and have people say, “Well, he’s in the industry. He’ll say nice things . . .” implying that my evaluation isn’t fair. Having someone with no skin in the game shoot it and make comments may imply credibility to those who doubt. My objective was to have someone else shoot it. I wanted to shoot it, but business before pleasure. If you’ve not read about the new gun, the TX22 is an aluminum-slide, polymer frame single action striker fired pistol. The slide is anodized, the barrel has a thread-protector at the muzzle and the gun ships with an adapter for muzzle devices. The polymer magazines have a 16-round capacity for free states; the gun ships with a pair of them, with replacements to be available for around $20 each. The gun is more-or-less full size for a ‘service pistol.’ The barrel is just over four inches long, the gun is 1 ¼” wide and weighs in at just over 17 ounces loaded. There’s a bilateral thumb safety lever and the frame’s dustcover has a short rail section for accessories. The single action trigger is called the Taurus Pittman Trigger System. It’s characterized as being a “rifle-like” striker system, with the trigger “safety” being the entire polymer trigger shoe, not a blade in the face of the trigger nor a ‘hinged’ trigger. 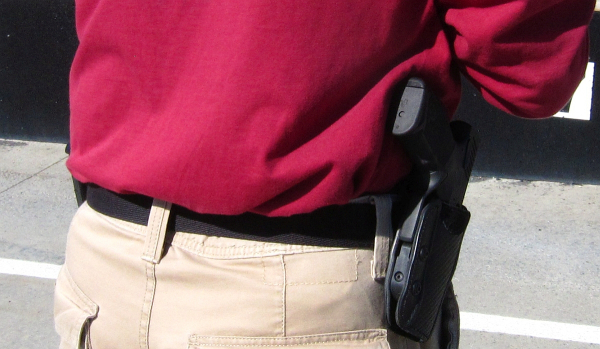 This should prevent “trigger bounce,” with a resulting discharge, if the gun is dropped. No. I did not test that. There’s also a striker block (firing pin safety plunger) to further increase the safety aspect. There is no magazine disconnector. 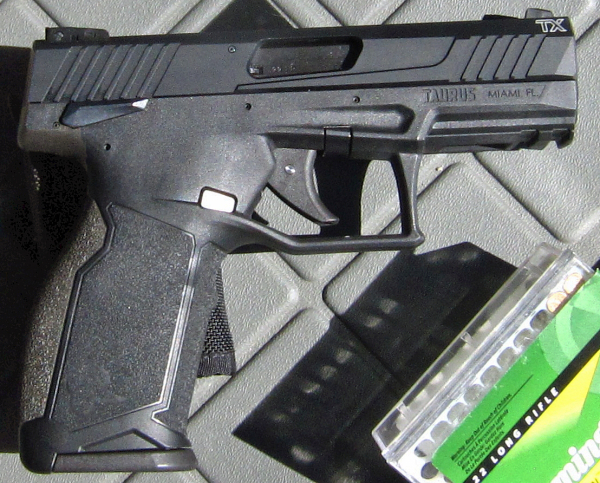 It appears Taurus designed this as a “trainer” for centerfire defense guns, for competition and for field use. The polymer sights are adjustable and feature the ‘standard’ 3-white dot arrangement. And disassembly is decidedly “centerfire-like” too. Is it ready to go right out of the box? I suppose it is. This sample was fired absent any prep at all. A commenter mentioned how gritty the slide felt when racked. As it’s an aluminum slide against a polymer receiver, this was not surprising and of no concern. I found that the Taurus fit the Safariland Custom Fit “just enough” without adjustment. After the appropriate warnings, I issued the gun to career reserve deputy Myron Stuckey with some ammo. He noted that loading the first few rounds was tough – he emphasized that. He also noted that the loading got really easy about four rounds into the magazine until reaching full capacity. He rounded out the firing line during a firing of the qualification course after doing a magazine or so in “learning the gun.” He had me fire a mag from it – nice of him – and I noted that the sights hug the top of the slide, the “fit” was superb and the trigger was certainly the equal of most striker fired guns. 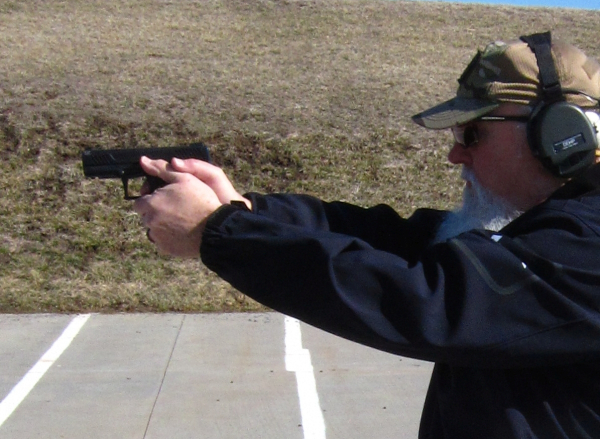 Myron was a fan of the trigger – and it showed in his shooting. I found that the Golden Bullet hit under the sights at 21 feet. Myron found that the rounds hit above the sights for him. Different strokes and all. He carried on through a fifty-round qual. At 25 yards, he encountered a strange malfunction that stopped everything. At first a premature lock-back, then a feedway stoppage. I tried to clear the offending round – a failure to extract? – and couldn’t. I realized what had happened. He induced the slide lock stoppage – pushing up on the slide stop? – and tried to reload over a loaded chamber. I simply dropped the slide, put a round on the target outside the silhouette (just to help his “score”) and reloaded the gun. He finished the last string of fire with no issues. One hundred rounds in nearly nothing in the life of a 22, certainly not enough to talk about “life-saving reliability,” if that was even a thing. The stoppage, I believe, was shooter induced. His big gorilla-hands could have induced the single problem, but he was effusive over the fit of the gun to the hand – as I was. Vastly different hand configurations with both finding the TX22 to be a good fit -- that’s an advancement in ergonomics. I’ll be trying this gun with a range of ammo for reliability and accuracy. At present, it seems the TX22 brings something extra to the shooting consumer. We’ll find out and we’ll keep you posted.